If you want to tie your fishing line securely to a hook, swivel or lure, the improved clinch knot would be your best bet. The widely used fishing knot scores above the regular clinch knot owing to an extra tuck under the final turn making it suitable for holding on to strong fishes. Give yourself enough length to work with as you require wrapping it 5 or even more times for a powerful knot. For heavier lines, though, you may reduce the turns to 4. Keep the cord moist and pliable so that it can be pulled. A ChapStick comes in handy for the purpose. You may cut the tag end if there is any excess. 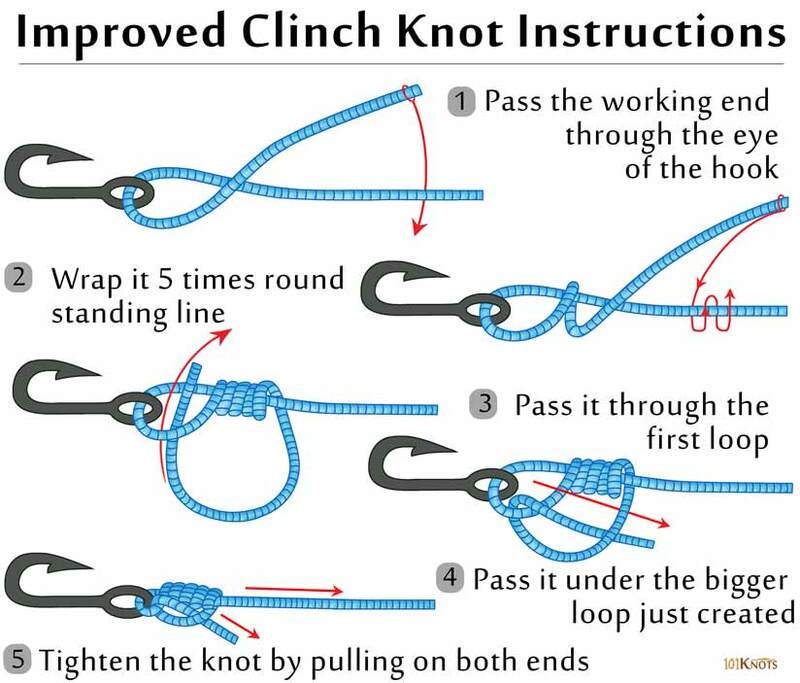 Clinch knot – An inferior version, it is a basic knot for fly to tippet connections. Quick and easy to tie. Allows fixing up a tippet of small diameter to a heavy wire hook. Difficult to tie on heavy lines. Not recommended for those testing more than 30 lb breaking strength. Not suitable for braided lines. Hence, inferior to the Palomar knot. Commonly used for fastening the leader to the fly. Popular for tying terminal tackle to a monofilament line. Trilene Knot – A superior knot specialized in tying monofilament lines.